AEC specializes in commercial relationships and representations involving commodities requiring ocean transport with focus on the Drybulk sector. All types of commodities and products are carried in our modern bulk carriers, mainly in Handysizes, Handymaxes & Supramaxes. However, the company also processes profound knowledge in the larger Bulker segments. AEC is constantly working with short term Time Charter Vessels, long term Time Charter Vessels and Owned Vessels in combination with our forward Cargo Book. AEC also offers Commercial Management services, giving ship owners the opportunity to gain access to our wealth of commercial experience and worldwide industry network. We possess several decades of commercial expertise and technical knowledge. 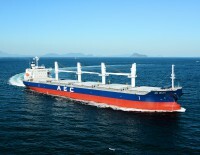 Backed by prominent financial and industry investors, AEC provides advanced shipping solutions with special focus on reliable and efficient customer service, quality performance, professional voyage execution and competitive cost optimization – all closely linked to our strong close commercial and operational relationships. The AEC fleet consist of modern Eco Bulk Carriers, mainly Japanese built. The standard is always kept high with a constant focus on reliable, first class, efficient, modern shipping services. Integrity is the keyword in AEC’s vision.